I am a huge fan of poultry, although it has taken many years for me to learn an appreciation for legs and thighs. I’ve always been a “white meat” girl, whether it was chicken or turkey, although recently I have become very fond of chicken thighs which are moist, flavorful, and best of all inexpensive. We bought an exceptionally large bag of chicken thighs at Costco and I recently pulled out a package from the freezer to cook for dinner. After looking through my refrigerator and pulling out a few ingredients I found there I put together this stuffed chicken recipes that turned out amazingly well. In fact, we loved this dish so much that I made it again for company this past weekend and I generally would never consider chicken thighs “company worthy”. The chicken rolls were so moist and delicious though that I knew they’d love it, and in fact everyone did although they thought it was veal and not humble chicken thighs. I am going to give the ingredients for 8 small thighs which would serve four as an entree portion. You can easily adapt the recipe if your thighs are larger and you therefore need less, or if you are feeding more than four. It is easiest if you buy skinless, boneless chicken thighs although it is relatively painless to debone them yourself if you have a sharp boning knife. I recommend sun-dried tomatoes that are packed in oil as they are very moist. Dried ones need to be soaked in water before using and are not generally as flavorful. These chicken thighs also reheat very well the next day! Poultry, both white and dark meat, is a great source of low fat protein. Both the skin and any fat are removed from the chicken before cooking. Low sodium chicken brother reduces the sodium count of the overall recipe. Poultry is a good source of low fat protein and these easy rolled chicken thighs can be prepared ahead of time making them a great idea for entertaining. Trim any extra fat from the thighs and pound lightly so the thighs are the same thickness throughout. Lay each chicken thigh open (skin side down) on top of a slice of prosciutto, and sprinkle with a couple of tablespoons of cheese. Next, sprinkle some of the sun-dried tomatoes on top of the cheese, then lay one basil leaf on each. Start at one end and firmly roll both the prosciutto and chicken thigh into a roll. Secure with either toothpicks or kitchen twine, and then continue to prepare the remaining chicken thighs in the same fashion. In a heavy pan large enough to hold all of the chicken thighs (use two if necessary), heat the olive oil over medium heat, and then brown all of the thighs lightly on all sides. Remove the thighs from the pan and add the garlic and cook until fragrant. Add the wine and deglaze the pan, using a fork to scrape up the browned bits from the bottom of the pan. Add the chicken broth, capers, and half the parsley and bring to a boil. Reduce the heat to a simmer and return the thighs to the pan. Partly cover the pan and simmer the thighs for at least 30 minutes over low heat. To thicken the sauce, remove the thighs from the pan to a warmed platter and using a whisk, mixture together the two tablespoons chicken broth with the corn starch until smooth, and then whisk the corn starch mixture into the pan until thickened. 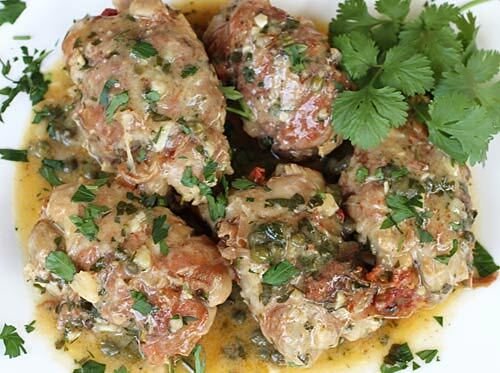 Remove the twine or toothpicks from the chicken thighs, and then pour the sauce over the thighs and sprinkle with remaining chopped parsley.